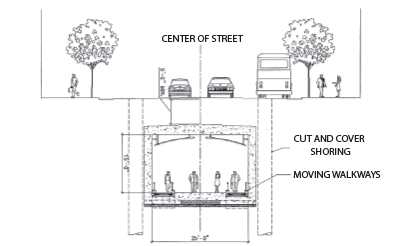 The 2004 FEIS/EIR-approved design included a pedestrian tunnel under Fremont Street between the Transit Center and a BART/Muni Metro station on Market Street. 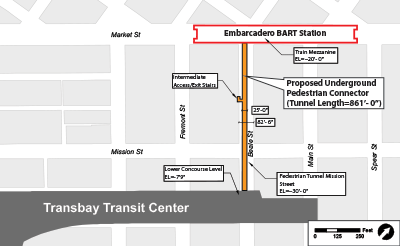 The proposed BART/Muni Underground Pedestrian Connector is an 800-foot pedestrian connection underneath Beale Street linking the Embarcadero BART/Muni Metro Station with the Transit Center. The new design takes advantage of the extended train box to provide this direct connection.